Another thing I should have posted earlier. I was contacted by the Jewish Museum and alerted of this special offer they are having for cyclists in support of everyone’s favorite monkey on a bike: Curious George. Hello, Iâ€™m Rebecca Wallis, the public relations intern at The Jewish Museum. 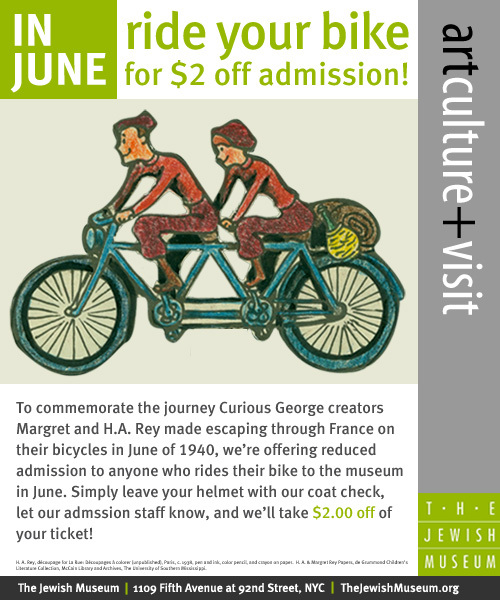 This month, we have a special promotion for bicyclists in support of our special exhibition Curious George Saves the Day: The Art of Margret and H. A. Rey. In June of 1940, Curious George creators Margret and H. A. Rey escaped Nazi-occupied France by bicycle. To commemorate this journey, The Jewish Museum is offering $2 off of admission to anyone who rides a bicycle to the museum this month. 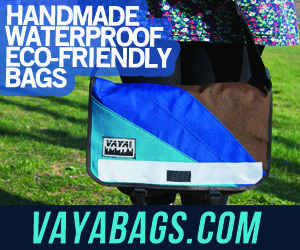 We believe your readers would be interested in this promotion. Curious George Saves the Day: The Art of Margret and H.A. Rey is on view through August 1st, and features nearly 80 original drawings for Margret and H. A. Rey’s childrenâ€™s books and documentation related to their escape from Nazi-occupied Europe. Both creators were born in Hamburg, Germany, to Jewish families and lived together in Paris from 1936 to 1940. Hours before the Nazis marched into the city in June 1940, the Reys fled on bicycles carrying drawings for their childrenâ€™s stories including one about the famous and lovable monkey. I hope that you will consider coming to view the exhibition. For more information about the exhibition please visit www.thejewishmuseum.org/exhibitions/curiousgeorge.